Yamaha Motor Releases the New Fascino Scooter, Trend-setting fashionable scooter for the Indian scooter market - News Releases | Yamaha Motor Co., Ltd.
IWATA, May 8, 2015 – Yamaha Motor Co., Ltd. (Tokyo:7272) will release the Fascino – a new fashionable scooter with the concept "Rich & Classy Modern Retro" – in India in May 2015. This new stylish model features a lightweight body with glamorous design, and offers user-friendliness as well as among the best fuel efficiency in the 115cc scooter category of India. In addition to practical functions such as comfort and storage, the new Fascino also has features such as 1) new body styling with dynamic curves embellished with chrome-plated parts to add a sense of refinement and class, 2) an engine with high combustion efficiency to offer among the best fuel efficiency in the class, and 3) weight of only 103kg (the lightest Yamaha scooter introduced in India) that contributes to both fuel efficiency and ease of handling. The new model will come in 5 colors, including a trendy matte chromatic coloring, to satisfy the needs of trend-conscious younger riders. 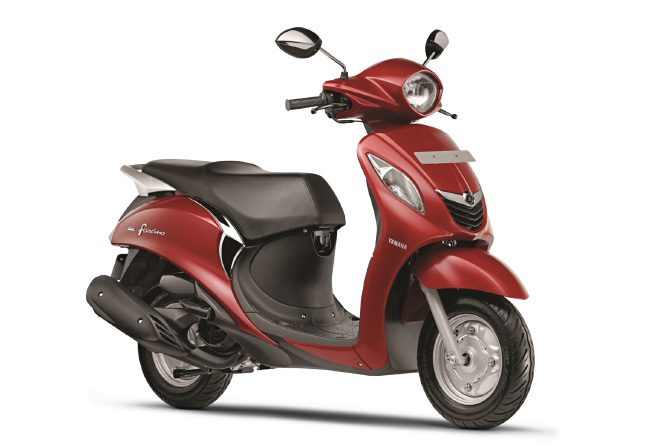 Fascino will be manufactured and sold by Yamaha Motor's group company IYM (India Yamaha Motor Pvt. Ltd.). India has the world's largest motorcycle market with a total annual demand of approximately 16 million units (2014). Within this total demand, the scooter category comprises over 25%, and is growing further year by year. Since 2012, Yamaha Motor has been introducing a range of scooters – including the CYGNUS RAY series and CYGNUS α – and has been increasing its number of new customers in the Indian market. The new Fascino is intended to further expand sales in the scooter category, which is expected to grow further the youth sector that has a keen interest in current fashion and trends.